Port and Maritime performance positive achievements registered in the Month of August 2017 according to the Northern Corridor Transport Observatory, could mainly be attributed to the expansion of Berth No 21, especially the initiatives to review and realign the ongoing port expansion projects, establishment of dry bulk facilities, construction of offshore single buoy mooring and investment in additional oil storage tanks. Berth No 21 has a 350-meter long quay and a depth of 15 meters that is capable of accommodating post-Panamax vessels of 8,000 twenty-foot equivalent units (TEU) capacity. Currently, there are initiatives to expand the inland container deport in Nairobi and to set up a dry port in Naivasha to decongest the port. The dry port is expected to reduce the overall cost of handling goods at the seaport. 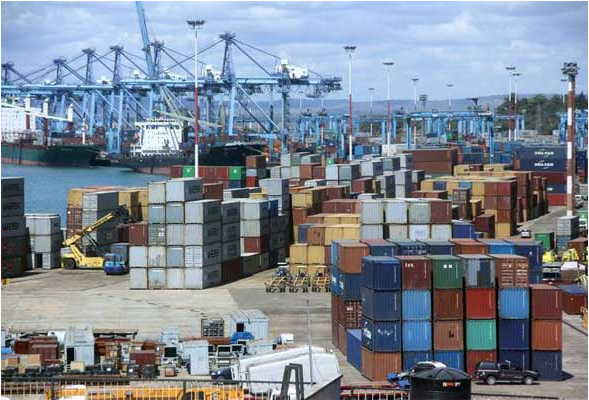 Mombasa Port is the busiest and the main gateway to East and Central Africa, serving a vast hinterland. The Port has handled more and more cargo over the years. The cargo throughput increased from 26.73 million tons in 2015 to 27.36 million tons in 2016. Containerised Cargo Dwell time, one of the Port Performance indicators which refers to the total time spent by cargo at the port from when the cargo is discharged from the vessel until it exits the port (average number of days the container stays in the Port yard), the year 2017 registered tremendous improvement. Containerised Cargo Dwell time has improved from an average 6.5 days in 2011 to less than 3 days (70 hours) in March 2017, and slightly climbed to 71.9 hours in August 2017. It was noted that this Port performance indicator remained within the envisaged target of 72 hours throughout the year 2017. Practically, this performance indicator comprises of time from unloading of the vessel and transferring containers to the storage yard, waiting in the container yard and processing to remove the container out of the port. This notwithstanding, the time recorded is still way above the benchmark of 48 hours suggesting there is still need to pursue strategies aimed at improving port efficiency. Ships turnaround time for containerized vessels, one the Maritime Performance indicators measured from the time the vessel arrives at the Port area (Fairway Buoy) to the time it leaves the port area demarcated by the fairway buoy, has also shown tremendous improvement since 2014. For the month of August 2017 this Performance indicator was recorded at 71.85 hours indicating a remarkable streak of improvement when compared with 86.72 hours recorded in August 2015. Vessel Waiting Time before Berth, another performance indicator that registered positive results against the target of 24 hours, shows that for the period from March 2016 to March 2017, the average Vessel waiting time was about 10 hours. Vessel Waiting Time before Berthis measured from the time the vessel arrives at the fairway buoy to the time at its first berth, including waiting at their own convenience. The Kenya Ports Authority (KPA) also tracks the Vessel actual waiting hours which tracks the time ship arrives at the fairway buoy to the time pilot boards the ship for clearance. The actual waiting time excludes the Vessels waiting at their own convenience. The actual waiting time improved from 36.8 hours in June 2017 to 16.15 hours in July 2017 and further to 12.87 hours in August 2017, suggesting that delays have been minimized at the Port. However, concerted efforts from the respective Stakeholders are highly needed to improve time taken in customs clearance at document processing centre. Time Taken at the Document Processing Centre in August 2017 was recorded at 2.14 hours, an increase from 1.9 hours in July 2017. The performance of this indicator is still higher than the target of one (01) hour as stipulated in the Mombasa Port Community Charter. Time taken in customs clearance at document processing centre heavily relies on the stability of SIMBA system, integrity of clearing agents, quality of declaration by the relevant agents and Document volumes waiting processing. Stakeholders should also double their efforts to improve Delay after Customs Release which refers to the time lapse between release and evacuation of cargo from the Port of Mombasa. The time in delay after customs release has been fluctuating, from 42 hours in August 2015 to 55.28 hours in August 2016 and 46.31 hours in August 2017. The performance is still high from the set 36 hours target. Furthermore, the performance has deteriorated from 42 hours which was established as baseline in 2012. The ongoing improvements of road infrastructure around the Port and implementation of the Standard Gauge Rail are expected to improve this indicator. Above all, Transporters should always speed up cargo pick up from the Port of Mombasa. The Northern Corridor Transport Observatory is a corridor monitoring tool with an online platform that tracks over 31 performance indicators whose data is obtained from multiple sources including; Electronic data from Stakeholders’ business systems, Global Positioning System (GPS) surveys, Road Transport Surveys and secondary data from existing reports and policies. The indicators relate to Volume/Capacity, Transport Rates/Costs, Transit time/delays and Efficiency/Productivity. The Transport Observatory also tracks indicators on road safety.